New bloggers want high traffic without hard work. Without any work you never get high traffic. You get a good amount of traffic on your blog when you write a unique content, but after that you still don't get high traffic. Today I am sharing with you some tricks there are always some help you to increase of traffic. So just use your brain and don't copy other web/blog content. You always write own and self made post on your blog. And save your blog earning in a long time. If you don't do this you lose your blog rank and traffic. I suggest you some tips you must do that. When you write something on your post, you must add some interlinked in your post content. If you are creating many interlinked on your blog, your blog gets a good reputation in search engines results and also high your page ranking in search. 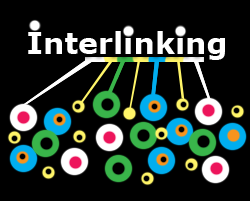 Interlinked are also helping user who visits your blog, and get much information on your blog. One more example, if you use much interlinked, other bloggers, many not copy your content because you use lots of interlinked and they don't waste time to link in your content. And your content is saved and always be unique. The link you are creating between posts or content must be really of use or highly related to your current post, It should be like for example! If you write a topic about (How To Make A Blogger Account) in your post so you must provide a link to another your old post (What is Blogger?) this is very helpful to the user and your ranking. Because many users like to read posts related another post and the visitor must be really interested in knowing of that device. The 2nd way is peoples are like to relate posts widgets at the end of your posts. And (Related Posts Widgets) also is Link within Related post widget. If you always follow above tips then it would must help you increasing your blog traffic and your earning also visitors stay longer on your blog. And every user like your page. And visit your blog again and again. Always provide good and save content to your user and make your blog user friendly. Under three post links are also explained about how to add Related posts widgets in your blog.